You can reset drive permissions using the single user start up mode on your Mac. When you turn on your Mac, it should display a gray or dark, almost black screen as it searches for your startup drive. Which color is shown depends on the model and age of your Mac. Once the drive is detected, you will see a blue screen as your Mac loads the boot information from your startup drive and then displays the desktop. Some Mac users won't actually see a blue or gray screen. With the advent of Retina displays and extended color spaces that the Mac now supports, the old blue and gray screens can appear much darker, almost black on Macs that have built-in displays, making it harder to discern which color the screen is. If you're using an external display, you should still be able to notice the difference between the gray and blue screens. We're going to call the screen colors by their old, classic names, although for some Mac users, the difference will be very difficult to detect as the screens will just look either nearly black or black. In this article, we will look at why a Mac may get stuck at the blue screen, and how to fix the problem. If your Mac has made it to the blue screen, we can rule out some possible problems right off the bat. To get to the blue screen, your Mac has to power up, run its basic self-test, check to ensure that the expected startup drive is available, and then start to load data from the startup drive. This is where it got stuck, which means your Mac is in pretty good shape overall, but your startup drive may have some problems or a peripheral connected to your Mac via a USB or Thunderbolt port is misbehaving. 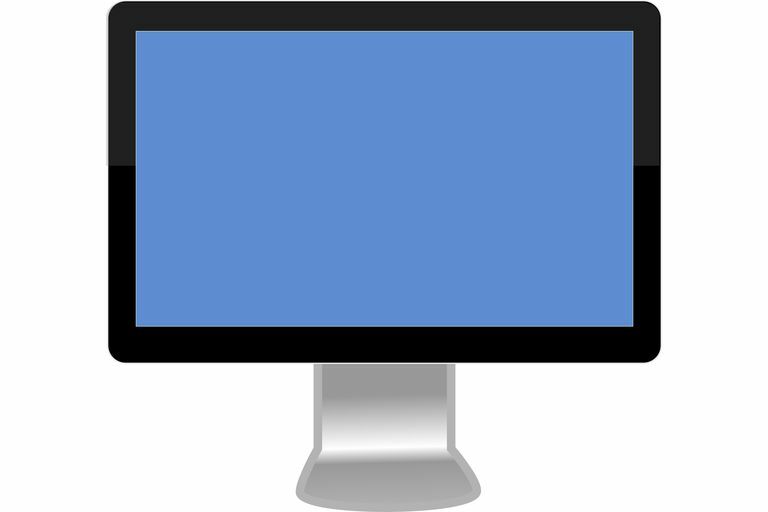 Peripherals, such as USB or Thunderbolt devices, can cause a Mac to stall at the blue screen. That's why one of the first things to try if you see the blue screen is disconnecting all your Mac's peripherals. While it is possible to just pull the USB or Thunderbolt cables from your Mac, it is much better to power your Mac off first. You can turn your Mac off by pressing and holding the power button until the Mac shuts off. Once shut down, you can disconnect the USB and Thunderbolt cables and then restart your Mac. If disconnecting your Mac's peripherals doesn't fix the issue, continue on to repairing the startup drive. Your startup drive may be suffering from one or more issues, many of which you can fix using Apple's Disk Utility. You can also use a third-party app, such as Drive Genius, TechTool Pro, or DiskWarrior, to repair drive damage. Because you can't start your Mac up successfully, you'll have to boot from another drive that has a system on it, or from a DVD install disk. If you're using OS X Lion or later, you can boot from the recovery disk; if you're not sure how to do that, you'll find instructions in the guide at the link below. If you don't have a startup option other than your usual startup drive, you can still try to repair the drive by starting your Mac in single-user mode. This is a special startup environment that allows you to work with your Mac using commands that you type into a Terminal-like display. (Terminal is a text-based app that is included with OS X or the macOS.) Because single-user mode doesn't require the startup drive to be completely functional, we can use some of the commands to perform drive repairs. No matter which method you're going to try - another startup drive, a DVD, the recovery disk, or single-user mode - you will find step-by-step instructions in the How Can I Repair My Hard Drive If My Mac Won’t Start? guide. In most cases, repairing the drive will get your Mac working again, but be aware that a drive that has exhibited this type of problem is likely to do it again. Take this as an early warning that your startup drive is having issues, and consider replacing the drive soon. Be proactive and make sure you have backups or clones of your startup drive available. While repairing the startup drive should solve the blue screen problem for most users, there's another less common drive issue that can cause a Mac to freeze at the blue screen, and that's a startup drive that has its permissions set incorrectly. This can happen as the result of a power outage or power surge or of turning off your Mac without going through the proper shutdown process. It can also happen to those of us who like to experiment with Terminal commands, and accidentally change the startup drive's permissions to not allow any access. Yes, it is possible to set a drive to deny all access. And if you happen to do that to your startup drive, your Mac won't boot. We're going to show you two ways to fix a drive that was set to no access. The first method assumes you're able to start your Mac using another startup drive or an install DVD. You can use the second method if you don't have access to another startup device. Boot your Mac from another startup device. You can do this by starting your Mac and holding down the option key. A list of available startup devices will display. Select a device and your Mac will use it to finish booting. Once your Mac displays the desktop, we're ready to correct the permissions problem. Launch Terminal, located in the /Applications/Utilities folder. You will be asked to provide your administrator password. Enter the information and press enter or return. Your startup drive should now have the correct permissions and be able to boot your Mac. If you don't have another startup device to use, you can still change the startup drive's permissions by using the special single-user startup mode. Start your Mac while holding down the command and s keys. Continue to hold both keys down until you see a few lines of scrolling text on your display. It will look like an old-fashioned computer terminal. Your Mac will now boot from the startup drive. If you still have problems, try repairing the startup drive using the methods described earlier in this article.